We can manufacture, supply and install geomembrane liners and waterproof lining systems for reservoirs, lakes, ponds, canals and lagoons. Our approach ensures a fast response to identifying the perfect lining solution for each project. We have the experience to consider timescale, budget, specification of material and specific site conditions. We provide a full 360 degree service that includes detailed design, liaison with contractors, full installation and inspection. Our high quality, CE marked range of waterproof lining products includes: Landflex PEHD (HDPE), Landflex PELL (LLDPE), Landflex BR (Butyl Rubber), Landflex EP (EPDM Rubber). Our Landflex G3000, G4000 and G6200 CBR Puncture resistant liner protection Geotextile complements the range, providing excellent protection against damage to our liners. Our selection of materials together with our expertly trained and qualified waterproof lining system installers guarantees the highest standards are met, and unforeseen challenges on site are swiftly resolved, enabling projects to be completed on time and on budget. Water is a scarce, valuable commodity and attenuation has become an essential requirement for irrigation and containment purposes. 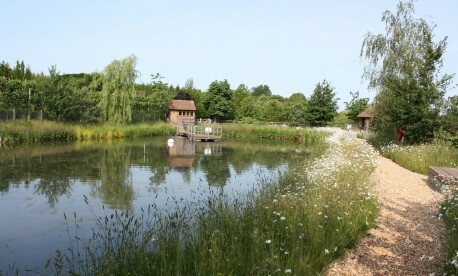 Regulations for effectively managing waste liquids and effluents mean that lagoons and ponds are often required to avoid discharge into rivers and other watercourses prior to treatment. Butek Landline understands the design, planning and grant aspects of this work and is used to partnering with specialist consultants in this field. The company has a product to suit every water containment requirement from contaminated water or chemical run-off to the storage of rainwater. A tailored approach is adopted for each project to suit clients’ needs, from offering complete reservoir construction works to providing only the geomembrane lining. We have performed extensive canal work for British Waterways as part of their ongoing restoration and refurbishment programme. Installation work often has to be performed during arduous winter months in preparation for spring re-opening. Our fully trained technicians have vast experience in undertaking this type of work under difficult conditions, where low temperature and high precipitation is expected. 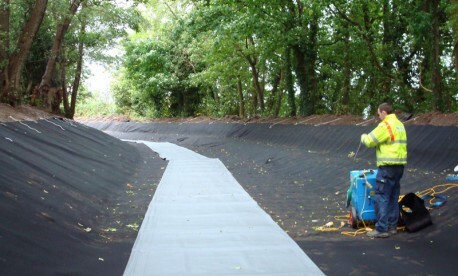 We have been able to provide a containment solution to precisely meet British Waterways’ stringent requirements using our 1.2mm Landflex PVC120AP lining system which has helped to secure sections of the network for future generations to enjoy. Butek Landline has extensive experience in the geomembrane lining and construction of specialist water features and in associated civil engineering, geosynthetics, electromechanical work, earthworks and landscaping. The company has worked for most of the principal architectural practices including Richard Rogers, Ove Arup, BDP, Charles Funke, Atkins, Gillespie and Derek Lovejoy. 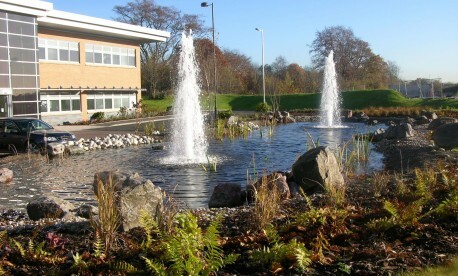 Butek Landline can take on all elements of the lining or construction work and can advise on all aspects of the water feature or pond design that impact directly on the geomembrane and its selection process. Butek Landline operates a fully documented ISO quality management system. Project management, monitoring, inspection and testing is provided in compliance with the contract Health & Safety plan. 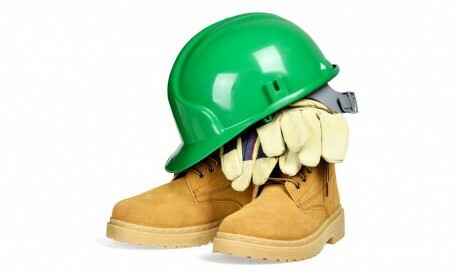 Experienced, full time, trained construction and installation crews use the latest plant and welding equipment to complete all projects, no matter how large or small, on schedule and within budget. The company offers competitive prices, quality assurance and Installation warranties.